At Parlor, we know your time is valuable. That's why our mission is to build a fun environment to gather with friends, shut off the outside world all while you enjoy affordable luxury beauty services. 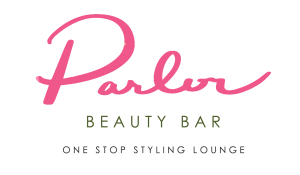 Parlor Beauty Bar is your one-stop shop for all your beauty needs! Life is busy, so visit Parlor Beauty Bar and relax with a glass of rosé while we pamper you. As Austin, Texas Premier Blow Dry & Beauty Bar that offers: expert blowouts in our blow dry bar, brow artistry including brow shaping, brow waxing, brow tinting, brow threading and brow tweezing in our Brow Bar, lash tinting, lash lifts, eyelash extensions, custom airbrush spray tanning, dermaplaning, facials, and facial waxing, tape-in hair extensions, professional makeup applications and makeup lessons, bridal services, private parties (birthday, bachelorette, baby showers, graduation) and private and corporate events. Experience the Parlor five-star experience for yourself. The Parlor Beauty Bar team is made up of a group of experienced beauty professionals that are passionate about their craft and strive to help you look and feel your very best! Parlor Beauty Bar also believes in family, giving back to our community and creating a work environment where our team can flourish. We are honored to be a part of this thriving Austin community and to stand among leading women entrepreneurs. The future of business is changing, and it is female. As a woman, I just wanted to feel beautiful and have a sense of normality, but undergoing multiple surgeries, managing countless doctor appointments, and being in the middle of two lawsuits made that difficult. At that point in my life, running around Austin for my beauty service needs was a challenge. That’s when the lightbulb went off and Parlor Beauty Bar was born. 💡 Parlor has been a labor of love. I hope that my story will inspire other women to keep moving forward and follow your dreams regardless of what obstacles you might face. I’m forever grateful for our amazing clients who have shown us so much love and support since day one. And, for my talented team who continues to strive for excellence each and every day through their craft and the client experience they deliver.